Bob Fox ‘Just an Old War Horse Tour’ ***Ticket Night*** Fresh from his success on stage as Songman in War Horse. When Bob sings a song about his beloved North East he imbues it with a magic that makes it his alone. 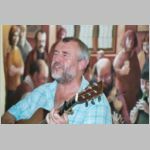 Expect songs of love, joy, work and humour, sometimes all four in one song all accompanied by a wonderful guitar style that can both drive or embellish a number. This man has served his time at his craft and it shows. Get your tickets early as I am polishing the house full sign.